This year’s 2013 Chili Bowl Nationals hosted 268 racers from all over the world. Competition was once again intense, racers were focused and all were out for the win. Friday during the C-Main, Pat drove the #7c hard and led the entire race in 1st position. On the last lap in turn 3, Pat found his self-high on the track and decided to let off to avoid damaging the car and was passed. He finished a hard-fought battle with a second place finish which allowed the team to advance to Saturday’s races. Saturday the #7c car started in 4th position for the G-Mail. This race was packed with all the Top Guns and was going to be a war. The car would need a 4th place finish to advance. The new motor was running good and Pat raced solid throughout, but some minor adjustments seemed to make the car run tight and high on the top. The race was very competitive and positions switched back and forth. The #7c Team led by driver Pat Schudy had a good run but finished in 7th position. In the end, the Swindell team clasps a 4th consecutive Chili Bowl National Championship. The car is intact, the driver is intact and both are running strong. We are looking forward to the following 2013 race season. For those who have NBC Sports, the race will be broadcast February 10, 2013 at 4:00 Eastern (3:00 our time). 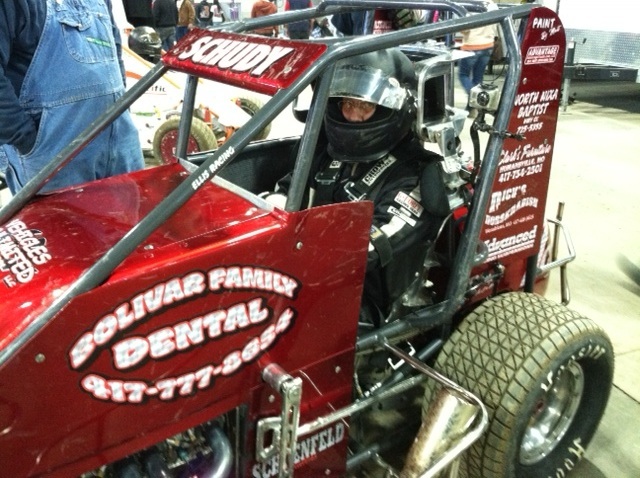 It is possible that you will see the #7c car driven by Pat Schudy in the Friday night C-Main.